Bond Arms has done it again! This Black Ash wood grip with Two Tone Star is amazing! 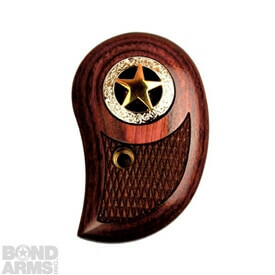 The Black Ash wood is beautifully finished giving you the deep black and silver colors that come from ash wood and to top of this brilliant piece of craftsmanship, there is a two tone star set into both the left and right side of this Bond Arms grip. The inset two tone star is made from metal and is both silver and gold in color. 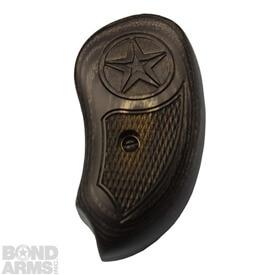 Sitting flush with the grip's face, this stunning accent will not interfere with your grip on your Bond Arms Derringer. This style also come with added comfort and practicality. 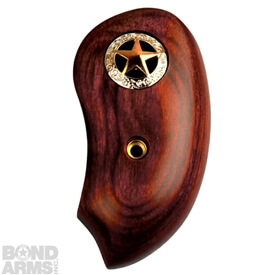 The extended Bond arms grips are an additional 3/4 of an inch longer than the standard/short Bond arms grips allowing room for an extra finger. This means added comfort and accuracy. 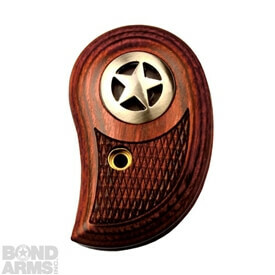 Merging form with function seamlessly is what makes this Bond Arms grip a great addition to your favorite Bond Arms Derringer.